‘YOU CAN HEAR THE CARS ROARING PAST’ – O.B. Engineers set up their gear in strange places. For the Jersey Road Race Roy Furneaux, O.B. 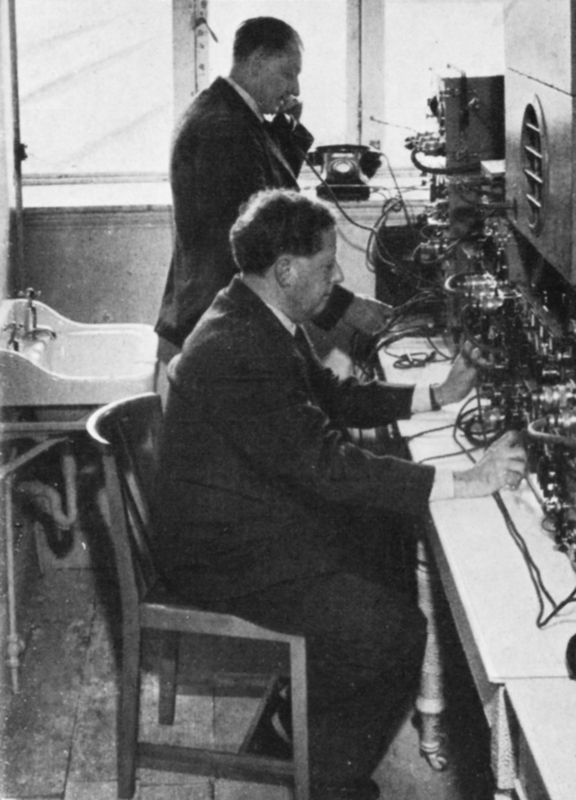 Chief, and Sid Day work in a hotel high above the course. The day-to-day life of the West. News bulletins, commentaries, mobile recordings. But that is not all. Sometimes on the road a recording car may pass another group of BBC engineers, travelling with a different sort of equipment. Not recording this time, but gear for a ‘live’ broadcast. These are the Outside Broadcast Engineers — ‘the O.B. boys’. Throughout the year their microphones appear all over the west-country, in every kind of place — from the obvious to the impossible. You’ll see them in cricket-pavilions, on football grounds, in public halls, in churches and lighthouses, in submarines and aeroplanes, and in fact anywhere where there’s good broadcasting material which—for one reason or another — cannot be brought to a studio. They are the men who ‘take us places’ — to the Jersey Road Race, to the county ground when Jack Crapp is standing up to Lindwall and playing himself into the England side, to the Bishop Rock Lighthouse on Christmas Day, and to the Corbiere at midnight on New Year’s Eve, to cathedrals and remote country churches, to the rough cliffs of Lundy and the summer paradise of Sark. 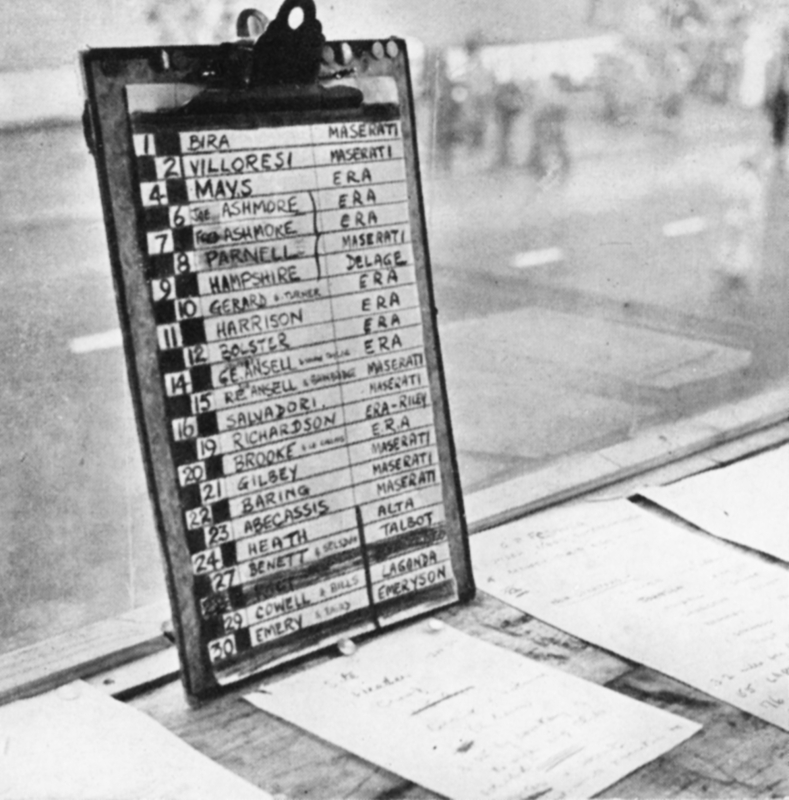 ‘RACE CARD’ – All set to go, in the commentators’ box at the Jersey Road Race. Wherever a microphone is wanted they take it, and set it up, and at the appointed time their signal comes through — so regularly and automatically that one forgets they perhaps made a fifty-mile detour because roads were snowbound, or had to hump their gear ashore through the breakers from an open boat, or were working under such difficulties that the cue to go ahead had to be given by flashing car headlamps to a distant look-out. 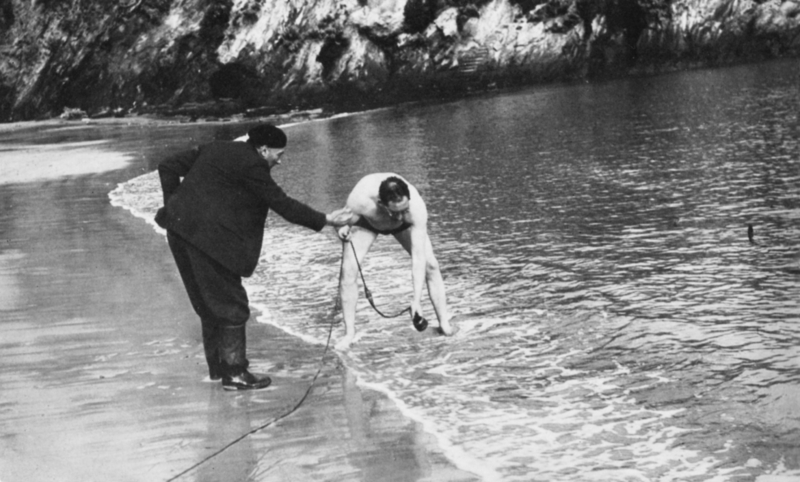 Stan Cooms’ trip to the Bishop Rock for Edward Ward’s Christmas Day broadcast stretched on for three weeks and they were both very glad to be taken off in the end by breeches buoy. Nicky Crocker’s customarily cheerful interruption of the Plug in the Wall series sounded as lively as usual when he spoke from the Breaksea Lightship; but he was in fact being swung about inside the lantern during a storm, had been very reasonably seasick during rehearsal, and was not to see his engineers and their gear safely ashore until two days later, when the seas moderated. But the broadcast, like hundreds of others, went off without a hitch— though there could have been plenty— and not only technical ones…. 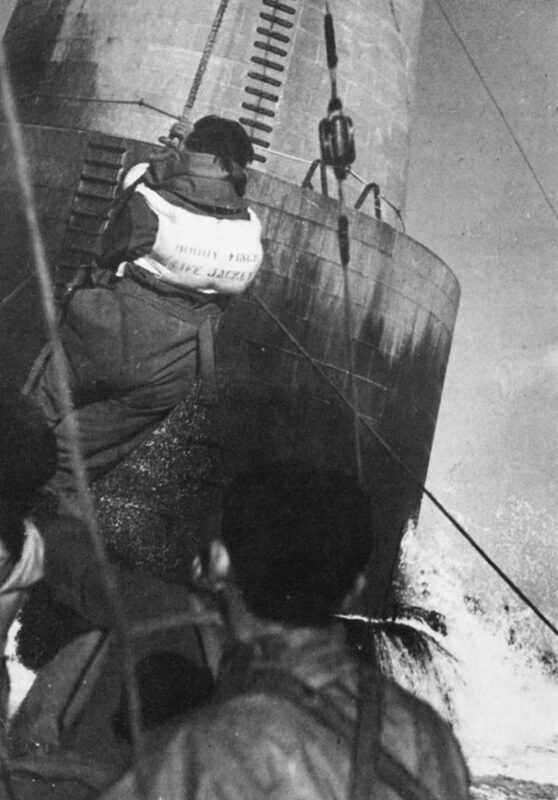 ‘GETTING DOWN TO IT’ – Ludwig Koch, undaunted by thoughts of Canute, urges the sea to stand and deliver. Senior programme engineer, Peter Ellingham, is prepared for all emergencies. These are the high spots, of course. The life of an O.B. engineer is not un-relievedly hazardous. The perils and adventures that he normally talks about have more to do with the appalling acoustics of a local hall, the difficulty of getting a good balance between different sections of an orchestra or a choir, the temperamental behaviour of portable transmitters, the problem of placing an effects mike so that the crowd noises sound heavy and realistic without drowning the commentator. 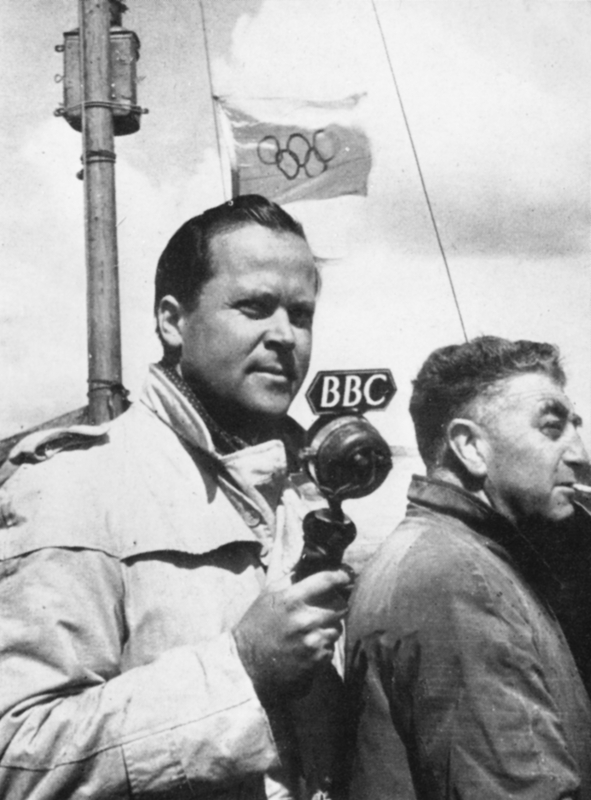 ‘OLYMPISKA SPEL’ – A Swedish commentator, Torsten Folin, reports the Olympic yachting at Torbay. During the Games West Region provided facilities for broadcasts to twenty-three nations. 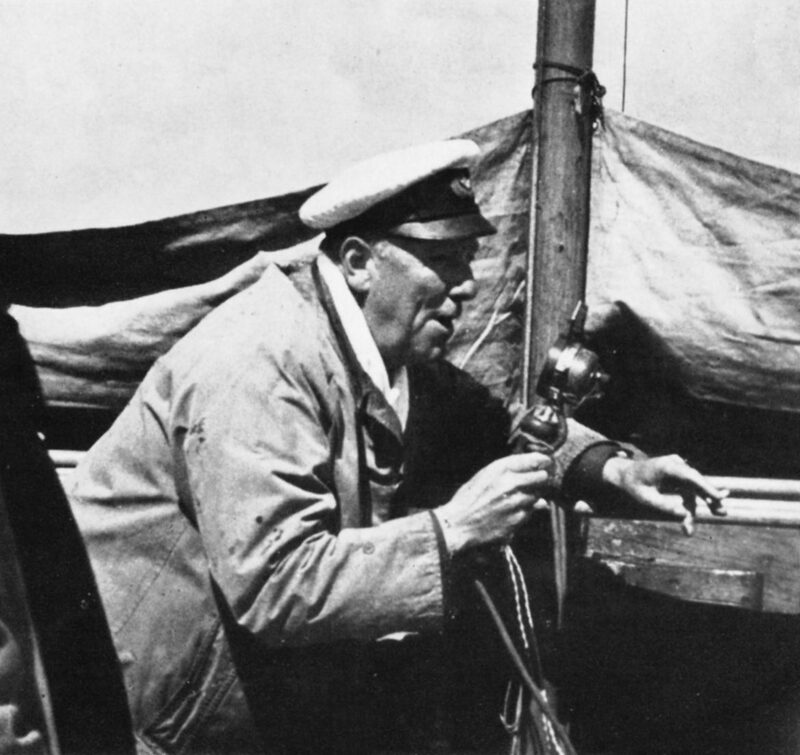 ARTHUR WAYCOTT shelters his microphone from rough weather at Torbay. ‘MY LONGEST FIVE MINUTES – Stan Cooms, Plymouth engineer, leaves the Bishop Rock lighthouse by breeches bouy – marooned for twenty-nine days after a Christmas Day broadcast.